Goldman Sachs, the longtime darling of the financial services community, usually traded for sixteen or seventeen times earnings. At the height of its glory–and despite being in pretty much the same business as Goldman–Enron was trading for sixty times earnings. When the opportunity in gas trading ran out and the new endeavors in broadband and weather failed to pan out, there were two choices for Enron: Dial back the market’s expectations or do something to keep the fiction going. Skilling and Enron CFO Andy Fastow chose the latter route and engaged in outright accounting fraud. This story brings to mind an article written by Michael Jensen about 10 years ago, “Agency Costs of Overvalued Equity.” In this paper, Jensen discusses the rampant value destruction that often arises as managers try anything to sustain an artificially high share price, including unscrupulous accounting practices. Remember that the blue line always drives the red, at least in the long run. Having an artificially high share price, which Enron certainly had, cannot magically lift the blue line. Either the value is there or it isn’t, and if it isn’t, there is only one direction for the share price to move. 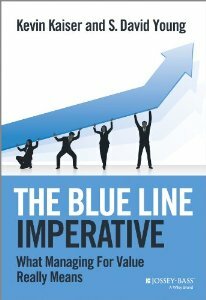 © 2019 The Blue Line Imperative.